Phnom Penh, our home sweet home! 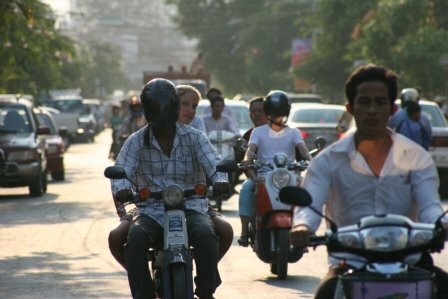 We are more than 3 weeks in Phnom Penh now. It’s very different from Siem Reap (as could be expected). Our house is great! We feel lucky everyday that we found it. Thanks to Sara, our bus neighbour, we landed into the very hospitable hands of the expat world and in our case more particularly into the hands of Alex, le français. The house has a large kitchen, dining area and garage on the ground floor. On the ground floor, predominantly in the kitchen, lives James, the cockroach. He is extremely fast and gigantic; one would almost believe he does workouts and cardio at the gym. Every time I try to give him a slap on the shoulder he sprints away under the fridge. I’m guessing he built himself a nice little condo under that fridge. On the first floor lives Alex ‘our landlord’. He is Tom Cruises’ twin brother. He has a broken toe from playing soccer against the locals and he opens locked doors with credit cards and iron wires. On the second floor is us. We each have our own room and bathroom. 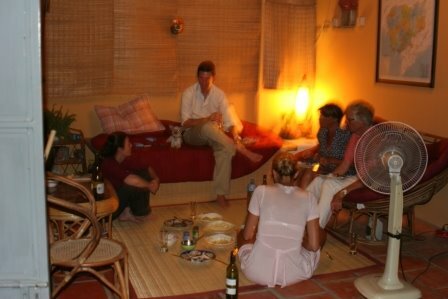 We miss our late night talks and PJ parties we had in our room in Siem Reap. But we found a solution for that! Our local mobile network provider gives away 20 free sms within network every week. We finally found a way to use them! On the second floor is also a living room with TV. We baptised it into our Grey’s Anatomy cinema room. We have little Grey marathons to escape from real live. Top floor boasts a big roof terrace with great sunsets and hammocks and the room of the lovely couple Supeck and Eric. Eric is probably one of the only Frenchmen in the world that doesn’t consider himself as French but as world citizen. He is probably also the only Frenchmen I know that speaks over 4 languages 😉 (je plaisante mes amis). Supeck is an example of the great friendly Khmer people. Although after he is going to bring spiders home to eat as he promised; I’m not sure I’ll still like him that much. On the terrace we have lovely dinnerparties! It’s buzzing with motos, tuktuks and black Lexus or Toyota 4WDs. It’s literally impossible to walk in this city because every bit of sidewalk is packed with cars, vendors and motos. I’m very happy that here too we possess our own bicycle and we can breeze around town. It’s the fastest way to get somewhere. 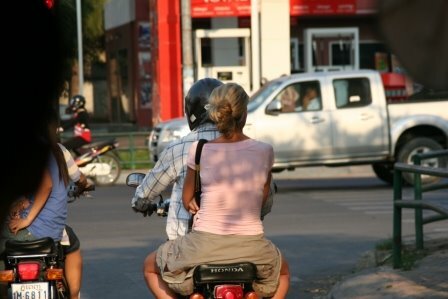 If you take a motodop, you better not be an innocent unknowing tourist. They usually have no clue where you want them to take you. Although they pretend they know exactly where you want to go. And then at the end of the ride they bug you that the price is to low because it was so far. Yeah, if you drive via Timbuktu first, for sure it’s far! I work in the National Pediatric Hospital now. It’s very interesting and different. Here are none of the laughing playing waving children we loved so much in Siem Reap. I thought Cambodian children didn’t know how to cry out there hearts. But they do! Maybe it’s the horrible stench of old urine mixed with dried up blood that hangs around here that makes them cry so much. The diseases I see here are ‘same same but different’. What definitely is different is the treatment. For every child that comes in, be it for a gastroenteritis, a runny nose, a bronchiolitis… they get pumped with two broad spectrum antibiotics. Not very good for building up an immune system, but very good indeed for building up resistant strains of bacteria. Their rationale is that they present very late with their disease, this after home antibiotics have failed or surinfection has imposed. Although this is true for many, it’s not for every one. And so I have a hard time dealing with this no brain policy. But anyway time is moving very fast here… way too fast… Especially if you have family visits and birthday weekends in Kep! I’ll be listening to Belgian kids crying before I know it. It scares me, it’s too short!